It is amazing to see God work. Just when you are sitting there going "HELLO, do you hear me?" and feel as if HE is not on you main line at the moment, HE IS THERE! Just call, HE answers! That reminds me of the song "JESUS on the main line". Ordinary day with an extraordinary friend! Do you sometimes feel that although you've been spending time with God, nothing happens? You wonder is God even there, or worse, if He has left you? Guess who produces this fear of being alone with God? Rest assured that the last thing Satan wants is for us to spend time with God. He will attack in all sorts of ways because he knows that the more time we spend with God, the more we will recognize all the lies and fears that he has worked so hard to firmly plant in our minds. When I decide to really seek God and listen for His voice, more than anything else, Satan will do everything he can to keep me distracted. He knows I will become a powerful adversary when I begin to listen to God. Don't let him fool you though; God will meet you any place, any time, no matter what's going on! Ask HIM to meet you today. . .
Today is the first baby of the family's 15th birthday! Our babies grow up to fast! The older I get the faster time goes! 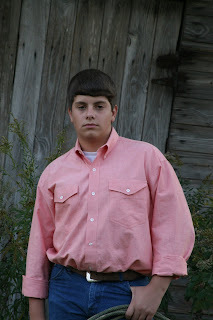 I love you Tanner and I am so proud of the young man you have turn out to be. Remember to always keep God close to you and let NO one take him away...HE is the reason we LIVE! HAPPY BIRTHDAY and I hope you have many more! YOU WILL ALWAYS BE MY HEART! A very special "Thank you!" from my family to yours, as some of you know my Dad had hip replacement surgery New Years Eve. He is doing very good! Everything went well and he is on his way to a long recovery period, so I want to say "Thanks" for your prayers and please continue to pray for him and my Mother. He is still in the hospital at Baptist in Jackson. We hope he will get to come home to the Franklin Co. Hospital on Monday to continue his recovery and therapy! He will be in the hospital for 14 to 21 days so he needs your prayers. . . Thanks!